Diabetes Art Day has collaborated with the Strip Safely initiative to raise awareness about the issue of test strip accuracy. As stated on the website, “The goal is to collect a body of images that capture the emotional experience of relying on inaccurate test strips to make decisions about food, activity and medication that affect our immediate and long term health outcomes.”While the campaign urges people to send letters and use social media to get the message out, Lee Ann, the person behind Diabetes Art Day, recognizes that printed letters just does not capture and convey the emotion the way visual art can. Inaccurate test strips is a huge problem, putting diabetic’s health and wellbeing at risk. We need more stringent accuracy requirements and the proper process to remove those that don’t meet this standard. It’s an issue that people need to know about. This edition of Diabetes Art Day is working to do just that, to bring awareness to this important issue so that action may be taken to ensure test strips and meters meet regulatory requirements. 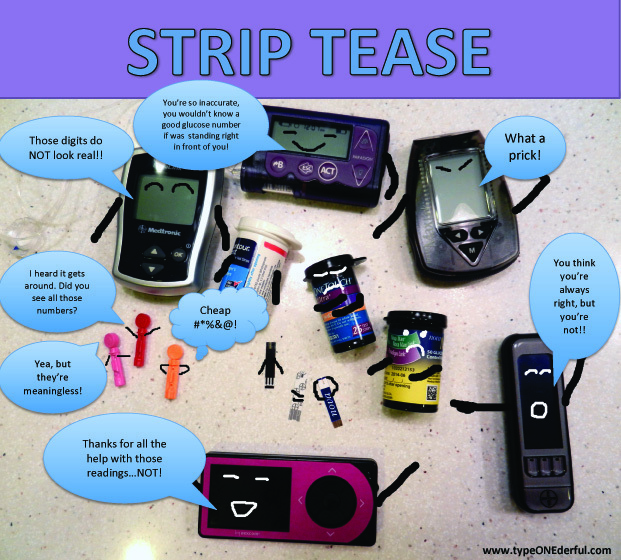 My artwork for this Diabetes Art Day plays off the words, “Strip Tease”. While there is some humor involved, it points to the important issue of using test strips that are safe and accurate rather than those that may be deceiving and therefore harmful. You can check out the gallery of images for this special Strip Safely Diabetes Art Day here. Lol! This is so great. Made me smile. Too cute.